My first experience making coffee with a stove top percolator. Coffee percolators generally have a bad reputation among gourmet coffee lovers. Their argument is that the water temperature is too high and that the process of percolating coffee results in an overly bitter brew. However, percolators still have a solid following of coffee drinkers who swear by them, and applaud the deep, rich taste they deliver. So I thought I’d give it a try. That’s right, I had never tried percolated coffee before. At least, I don’t remember ever having had any. Certainly, I have never owned a percolator. To spice things up a little, I decided to make life a little harder by getting myself a stove-top percolator. Electric percolators automate the process, controlling both the temperature of the water and the length of the percolating process. Why a stove top model? Because I wanted to make some coffee the way it was brewed by my parents and their generation. Also, a stove top percolator is simplicity itself. No fancy parts. Just the pot, a stem, a basket and a basket lid. And, of a course, a lid with a small glass globe in which you can see the water and coffee as it is pushed up through the stem. For anyone trying to make coffee in a brewer with no plastic parts, you’ll be interested to know that in the stove-top model I have, the water and coffee comes into contact only with stainless steel and the glass globe. No plastics! As with other brewing methods, you add one tablespoon of ground coffee for every cup, or 8 ounces of water. With a percolator, you use a coarse grind. Don’t grind it too fine, or you will get grinds in your coffee. In a basic percolator there is no filter beyond the holes in the steel filter basket. And I like that, because it means I never have to buy paper filters, or worry about plastic reusable filters. 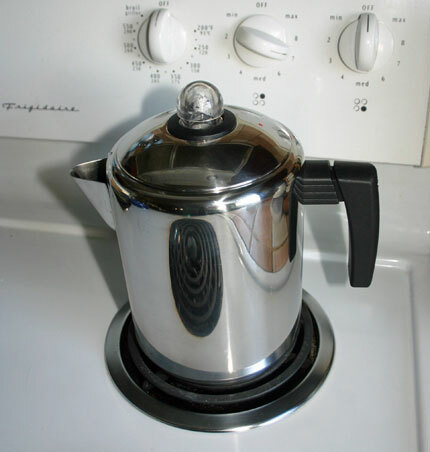 The key to making decent coffee with a stove top percolator is to raise the temperature of the water slowly, and then reduce the heat once the pot starts perking. This means making percolated coffee takes longer than using a drip brewer. And perhaps that’s one of the reasons it has fallen out of favor. Anyway, I first set the stove top at medium to high heat, until I saw the water begin to bubble up into the globe. I then reduced the heat to a point where I saw the globe “perk” once every two or three seconds. In other words, slowly does it. From the time the water first perking into the globe, I left the pot on the stove for an additional five minutes, over that lower heat. The coffee was far from being the awful, bitter brew that detractors of percolators warn about. In fact, it was a lot better that most coffees I am served from drip brewers. Was it as good as a coffee made carefully with a French press? Well, I’ll draw a line there. For me, I find it hard to beat the French press. But to be fair, this was my first time with a stove-top percolator. After some more practice, I don’t see why I wouldn’t enjoy percolated coffee as much any other. And on the plus side, it’s an extraordinarily simple system. All steel, no fancy tubing or flashing lights, and nothing to go wrong or break. If you want to try perked coffee, and can’t find any percolators in your local stores, you can buy coffee percolators at Amazon.com. Review of the Hamilton Beach coffee percolator.